The Mona Tree Irrigation System forms an irrigation ring around the rootball of the planting or around a large planter to ensure optimal growth. Each individual link within the ring acts as a reservoir to hold water and distribute to the plant's roots as and when required. 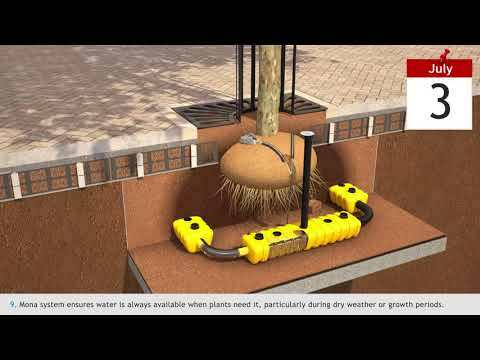 The Mona Tree Irrigation System is a 100% efficient, subterranean system for watering trees and shrubs. It is the cost effective and environmentally friendly solution for both interior and exterior landscaping. The Mona Tree Irrigation System ensures that water and nutrients are delivered in the right quantity to the root of the tree or plants, resulting in improved root development and optimal growth.Mona Plant System Rings have been developed specifically after requests from specifiers and contractors wishing to effectively and efficiently irrigate a tree rootball or a planter. It is the most efficient method of ensuring quick establishment and a healthy start for trees and plants. Mona Plant System Rings have been installed in many projects across the UK and Europe. Particularly suitable for interior landscape projects with large planter installations. Ensures quick establishment of plants and healthy root development, provides a more robust solution to the watering of large trees reservoirs surround the rootball to provide a continuous source of water. The system forms a ring around the rootball to ensure optimal growth. Ideal for installation of rootball trees in hard landscaped areas. The Mona Ring 24 Tree Irrigation System forms an irrigation ring around the rootball of the planting or around a large planter to ensure optimal growth. Each individual link within the ring acts as a reservoir to hold water and distribute to the plant's roots as and when required. The Mona Tree Irrigation System is a 100% efficient, subterranean system for watering trees and shrubs. It is the cost effective and environmentally friendly solution for both interior and exterior landscaping. The Mona Tree Irrigation System ensures that water and nutrients are delivered in the right quantity to the root of the tree or plants, resulting in improved root development and optimal growth.Mona Plant System Rings have been developed specifically after requests from specifiers and contractors wishing to effectively and efficiently irrigate a tree rootball or a planter. It is the most efficient method of ensuring quick establishment and a healthy start for trees and plants. Mona Plant System Rings have been installed in many projects across the UK and Europe. Particularly suitable for interior landscape projects with large planter installations. Ensures quick establishment of plants and healthy root development, provides a more robust solution to the watering of large trees reservoirs surround the rootball to provide a continuous source of water. The system forms a ring around the rootball to ensure optimal growth. Ideal for installation of rootball trees in hard landscaped areas.